Online registration for the walk is now closed. You can register on Sunday morning at the walk starting at 9am. Download a pledge form to collect pledges for the walk here. Walk registration below. PLEASE NOTE: t-shirts are available for purchase here, or by donating $15 or more (each) in the donation area of the registration form below. *Registration will also be available onsite on the morning of the walk. The Suicide Prevention Awareness Walk is being held Sunday, September 16, 2018 at 9:00am to 12:00pm. 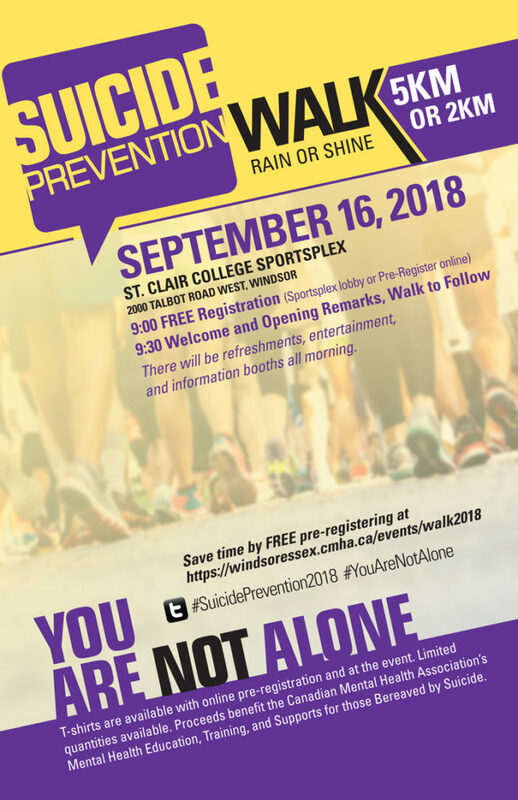 Taking place at St. Clair College, participants will walk from the SportsPlex through the college campus and alongside the Herb Gray Parkway Trail. There will be 2km and 5km walk options. In the event of inclement weather, the walk will be held on the track inside the SportsPlex. It is FREE to register for the walk. Participants who would like to donate to the walk can do so HERE and may also purchase a Suicide Prevention Awareness T-shirt HERE, or receive one by donating $15 or more when registering for the walk (shirts available while supplies last). A special performance will also occur throughout the event to help promote healing through music! Want to raise pledges in support of Suicide Prevention Awareness programs at CMHA-WECB? Download a pledge form and bring the completed form and all funds collected with you on Walk day. In consideration of the acceptance of my application and the permission to participate as an entrant in the Suicide Prevention Awareness Walk on Sunday, September 16th, 2018. I for myself, my heirs, executors, administrators, successors, and assigns HEREBY RELEASE, WAIVE AND FOR-EVER DISCHARGE Canadian Mental Health Association and all its Branches, and all other associations, sanctioning bodies and sponsoring companies, and elected and appointed officials, directors, successors and assigns OF AND FROM ALL claims, demands, damages, costs, expenses, actions and causes of action, whether in law or equity, in respect of death, injury, loss or damage to my person or property HOWSOEVER CAUSED, arising or to arise by reason of my participation in the said event, whether as a spectator, participant, or otherwise, whether prior to, during or subsequent to the event. AND NOTWITHSTANDING that same may have contributed to or occasioned by the negligence of the aforesaid. I hereby agree to periodic mailings both electronic and physical from the specific branch of the Canadian Mental Health Association regarding my registration and donation support. Personal information collected by the Canadian Mental Health Association is for registration and results purposes only, and will only be shared with the specific branch of the Canadian Mental Health Association I am supporting or walking for. Further, I hereby grant full permission to any and all the foregoing to use any photography, video tapes, motion pictures, recordings or any other record of this event for promotional purposes. I FURTHER HEREBY UNDERTAKE TO HOLD AND SAVE HARMLESS AND AGREE TO INDEMNIFY all of the aforesaid from and against any and all liability incurred by any or all of them arising as a result of, or in any way connected with my participation in the said event. BY SUBMITTING THIS ENTRY, I ACKNOWLEDGE HAVING READ, UNDERSTOOD, AND AGREE TO THE ABOVE WAIVER, RELEASE and INDEMNITY. I WARRANT that I am physically fit to participate in this event. I am 19 years or older, or I am the legal parent or guardian of the participant.